The trail at Beacon’s Beach. 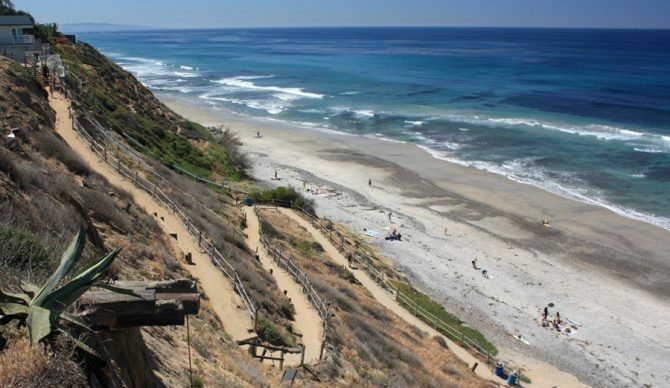 Finding the right path forward for beach access at Beacon’s Beach in Leucadia is something the Surfrider Foundation San Diego Chapter takes very seriously. We all love the trail at Beacon’s and want it to stay open as long as possible. In fact, we actually agree with Peter Brately and the people at Preserve Beacon’s more than one might think after reading his recent piece. Because we consider beach access critical and value the trail so much, Surfrider has been engaged in the public process since 2001. Representatives from the San Diego Chapter have attended public City Council meetings, reviewed documents, and attended workshops to protect the coast and public beach access. When it comes to politics and civic engagement, the public has to actively pay attention, read local media, check City Council agendas, and more. For those wishing to protect the coast, the Surfrider Foundation often highlights critical issues; in fact, the access battle at Beacon’s has been on our chapter website and in our newsletter numerous times over the years. At one point, when Surfrider was still the only voice on this issue, the city arranged a meeting to have their consultants explain a proposed armoring solution in detail. We did not agree with the proposal, however, so we kept pushing for a non-armoring solution that complies with the State Parks General Plan. That is why we have suggested specific permit language to ensure the city has to obtain a separate permit before making any changes to the trail. The City of Encinitas is also committed to maintaining the trail, continuing current levels of funding for trail maintenance, and upholding the requirements of their agreement with California’s Department of Parks and Recreation (DPR). The problem is the trail is not currently safe. It has a “factor of safety” of 1, which is not stable. Common practice requires a 1.5 factor of safety. The trail would become safer for continued use once the parking lot is reconfigured. And currently, seven parking spots are undermined and in danger of failing. In situations like this, where coastal access and coastal preservation are in conflict, we work to find the best solution to protect the coasts and the public’s right to beach access. Surfrider doesn’t want to see a reduction in parking at Beacon’s but the reality is the bluffs are eroding and prone to further landslides. The parking lot has to be moved back or the entire bluff will need to be armored. On an already narrow beach with an increasing sea level rise, armoring the bluffs would be catastrophic. Indeed, armoring destroys beaches. The city and all of us want to maintain access at Beacon’s. And stairs are the best way to do that — armoring is not, and it conflicts with the DPR General Plan. We believe the solution of constructing a staircase is the best path forward in this situation. We originally advocated for wood stairs, but we later learned there are benefits of concrete in this specific situation, such as a much narrower staircase with less visible impacts and fewer pilings into the bluff, translating into less disturbance of the bluff. Surfrider supports community engagement and the Environmental Review required by law. In this situation, the city qualifies for an Emergency Exemption under CEQA. What gives us some additional assurance in this situation is that the city did an Environmental Impact Report (EIR) on the Beacon’s access issue back in 2006 studying the options of a seawall, stairs, and no project. In that study, stairs were found to be the environmentally-superior alternative that protects public access and coastal preservation. The environmental review process through the Coastal Commission is also extensive. We are glad the currently concerned residents are engaged and look forward to working together to find the best, realistic solution to maintaining the coast and access at our beloved Beacon’s. Editor’s Note: After hearing from the community, the Planning Commission has sent the project back to staff for more community input and to consider a redesign of the stairs. The upcoming workshops will be held Monday, Sept. 17, 2018, 6 to 8 p.m. and Monday, Oct. 15, 6 to 8 p.m. at the City of Encinitas City Council Chambers, 505 South Vulcan Ave., Encinitas CA 92024.